The summer is pretty much over but a few fruits/foods of the season are still around. With the impending lack of in-season peaches upon us, I finally decided that I needed to make a peach cobbler since Duc had mentioned it so long ago. Actually, it was supposed to be the prize for him for whenever he fixed his oven but since that ended up being quite the hassle, I took it upon myself to make one at home. My search for cheap peaches at Korean supermarkets was fruitless so I went with nectarines instead. What a great alternative! 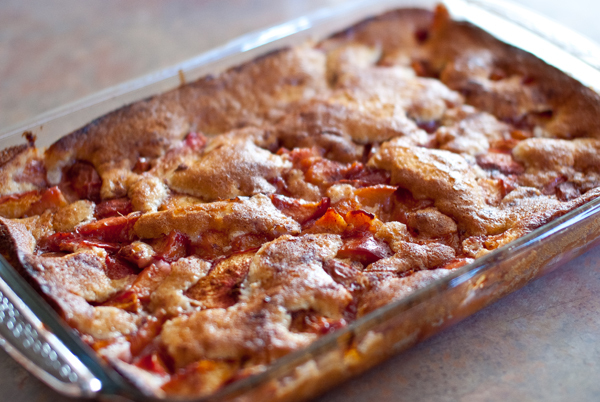 The nectarines stopped the cobbler from being overly sweet and definitely added a nice tang and firmness to the dessert. I'm going to make this again fairly soon I believe. It was especially delicious warm with vanilla ice cream. Dice up your nectarines. If you want to remove the skins, blanch them and take the skins off. I didn't because a lot of nutrients are in fruit skins so I wanted to keep them on. The pieces of the nectarine don't have to be perfectly diced though because a cobbler doesn't have to be perfect by any means. In a separate bowl, combine 1 cup of flour w/1 cup of sugar, the baking powder, and the salt. Add milk slowly until ingredients are moist; add remaining flour and mix until smooth. In a large pot or saucepan, heat the nectarines, lemon juice, and remaining sugar (1 cup) on high, stirring constantly. Preheat the oven at 375°F. While that is going on, put the butter in a 13x9 baking dish and let it melt in the oven. When the butter has melted, pour your batter into the dish WITHOUT stirring. When the nectarines have softened, use a slotted spoon to add the fruit to the dish WITHOUT stirring the contents. There will be a lot of leftover juice/liquid that you don't want to add to the dish lest it mess up the consistency of the cobbler. Once you have all the layers in place, sprinkle on the cinnamon and nutmeg as you see fit. Put in the oven for 40-45 minutes or until the dough is golden brown. Take out and enjoy. This tastes great when warm and with ice cream! It's even better with Dreyer's Pumkin ice cream. 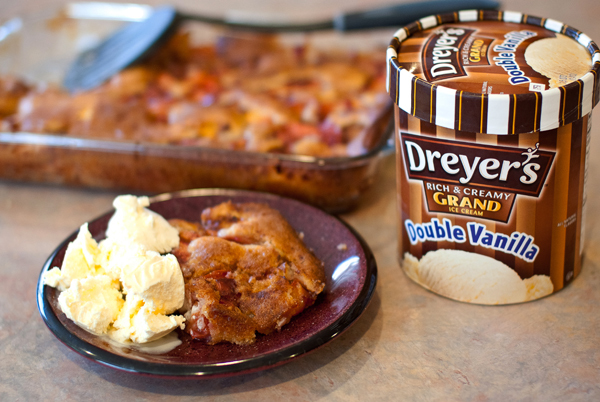 You may have out done the peach cobbler!